in turn pollinate the flowers. a match meant to be. Thank you for this poetic introduction. I know about them very little, and have only seen them three or four times in my life, never close enough for a photograph. Beautiful flying flowers. You are welcome, Inese. I’m glad you enjoyed it. What an amazing photo. How beautiuful!! Hummingbirds are amazing. When I was little and we lived in the country she had tons of feeds up and there were so many! Such amazing animals!! I agree. Hummingbirds are fascinating and so much fun to watch. Your description enhances the wonder of the picture! Beautiful..
I’m glad you enjoyed it. Thanks for stopping by. Didn’t think about the refilling of nectar…Thanks! Great colors/ great photo. Thanks for your comment. Hummingbirds are a fun subject. I did not know that hummingbirds were drawn to specific flowers. Lovely photo! Yes, certain flowers have actually evolved to accommodate them. I’m so glad you enjoyed the post. I think hummingbirds are quite special, too. Indeed they are, Tom. Thanks for stopping by. We don’t see them until they migrate through in the fall. It’s neat that they visit your hostas. Oh, that is so beautiful! The blur of wings is very cool. My first impression when I saw this photo was of a mythical flying, yellow-headed creature. Your prose brought me back on point, incredibly well written, and so true. Even more so than the relationship between bees and flowers. 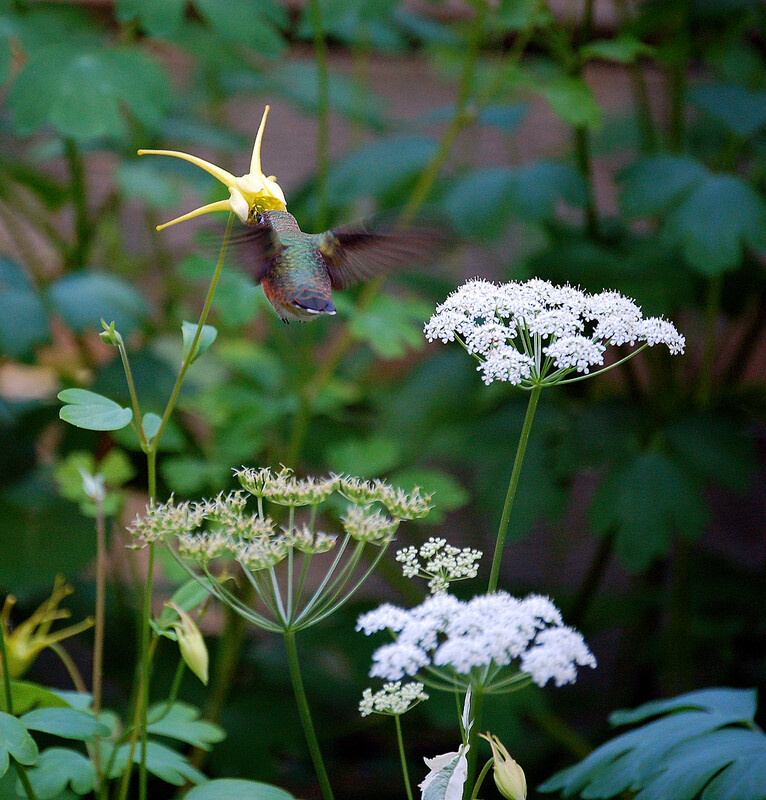 Yes, it’s a little different perspective from the tail end of the hummingbird. It takes a moment to realize what you’re looking at! I find hummingbirds intriguing. They are the smallest bird, yet are well equipped to survive and quite feisty to boot. Yes, it is quite symbiotic in a positive way. Perfect choice for this challenge. Your photo brought me a smile. Thanks for sharing it and the prose. I would say bird photography always requires patience, with good luck thrown in, too. Thanks for your comment and for stopping by!